A complete MBA level Finance & IB guide at your fingertips! "There are a lot of details to consider in tackling an investment banking problem, and I found this tool to be an ideal way of cementing a mental 'checklist' of relevant points in my mind"
The Finance and IB App is a powerful interview preparation and reference tool. All the information you need to ace your finance and investment banking interviews is intuitively laid out and cross referenced between the accounting, valuation, capital markets and LBOs and M&A sections. 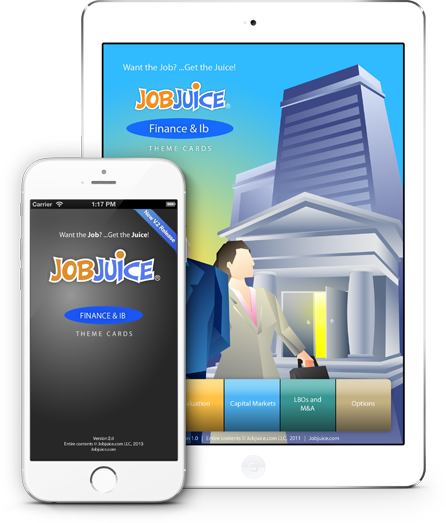 The App contains over 60 cards and includes a complete section on interview strategies that will help you prepare for the most demanding job interviews at the top firms. Access over 60 cards filled with essential accounting, finance, M&A and valuation concepts. Easily browse through topics presented in a practical “quick reference” format. 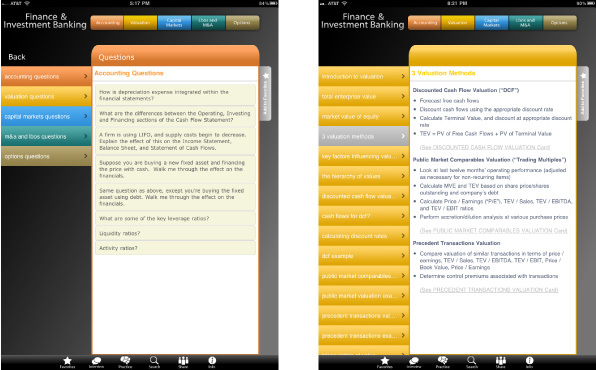 Review finance on the bus, in a meeting, at lunch, in class…anywhere, anytime. Use the complete finance interview section to ace your finance job interviews! Use the practice section to flip through random cards and test your memory. Easily navigate through deck with built in links and cross referencing. Identify and understand external and internal factors affecting a company’s business and select viable strategies to gain competitive advantage. Understand the critical elements of a successful strategy implementation process. Ace your consulting job interviews using the complete consulting interview section!